Used to be: the Camden Brewing Co.
Amusingly hipster styled, the authenticity which is the watchword of this urban tribe does make for a good combination in all. The inside furnishings are pleasingly distressed in dark wood, the service is good and there are interesting beers including a green IPA from Dark Star. I was there for a Christmas lunch which aimed at gourmet status but was actually rather workaday. Another old fashioned looking pub tucked away just off Camden Town. 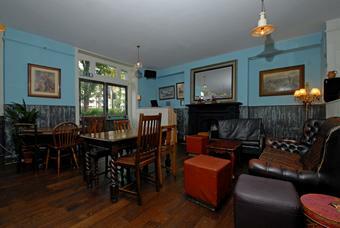 As you approach you notice the large front seating area with benches before going inside to the very open plan area and the bar to your right. 3 ales on and I went for a pint of Revolution’s Signature Pale @ 4.1% It was a decent pint. Lots of bar staff but most of them were in a state of bewilderment and it took a few glances from me to get recognised, there were only 2 other people being served! I was informed that this is THE place for Gin in the area and judging by the selection of Gins listed on the blackboard this is certainly the case, however I didn’t try any. There’s also a garden out the back. An unexpected and fortuitous find in a largely residential (and publess) area. I nearly missed it as its sign is not all that clear and the large external blind (like a shop's) masks much of the front of the pub. I am glad I didn't walk by. 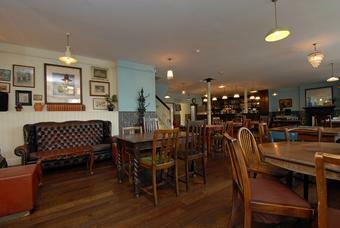 A nicely laid out pub with plenty of tables for diners and with with friendly and efficient staff. There is a good selection of home-cooked food made from fairly local ingredients (the sources are shown on the menu - a very commendable thing). My "Faucett Lamburger" was all that one could have wanted. Neither the food nor the beer were especially cheap - but we are talking London prices, of course, and I can't complain about the value. For those who wish to emulate the eponymous Colonel and sample his favourote tipple, gin, there is a very fine selection (32 at the time of my visit). I didn't sample any myself as I am an ale drinker and I was pleased to find 4 beer engines, all connected. The predictable nationals - Sharps and Adnams - took up two of the engines, but the other two dispensed ales from local brewery, Trinity. I tried both and they were in top condition. I would have preferred a greater choice of beers - but I am really nitpicking from the standpoint of a lifetime ale enthusiast. Excellent real ales: four on handpump today, kept in good condition. The pic is accurate. Staff helpful. Glad if found it. Absolutely Fab place and amazing food. Can't wait to come back during Marathon weekend.